Lent starts today; if you are still looking for a Bible study, check out the tab above. We have a tremendous response so far, and we look forward to hearing people’s reflections on the course and on their own hermeneutics. The last pages of the course have feedback questions which the interim committee hopes all users will return to us. If you have already chosen your Lent course, you can still be involved with BACI. 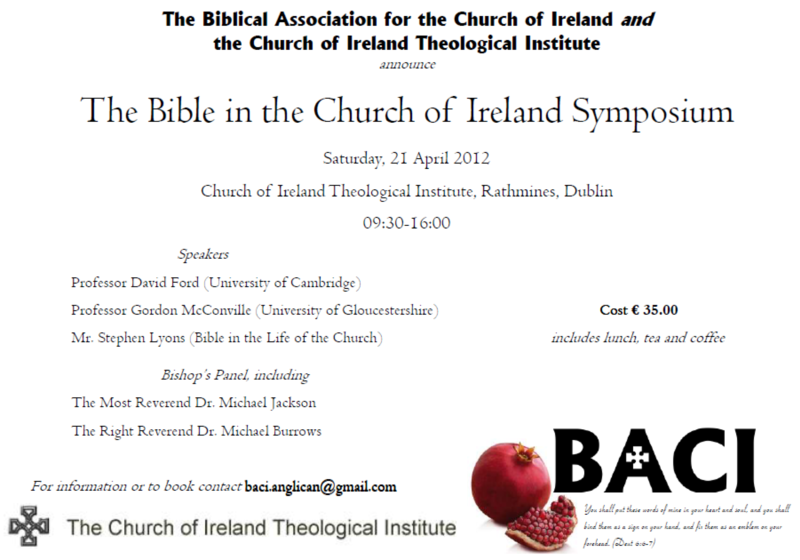 On 21 April, BACI is holding a day conference on “The Bible in the Church of Ireland” at the Church of Ireland Theological Institute in Braemor Park, Dublin 14. A flier for the event was included in some of the printed A5 Lent booklets. Bookings and inquiries can be directed to baci.anglican@gmail.com. 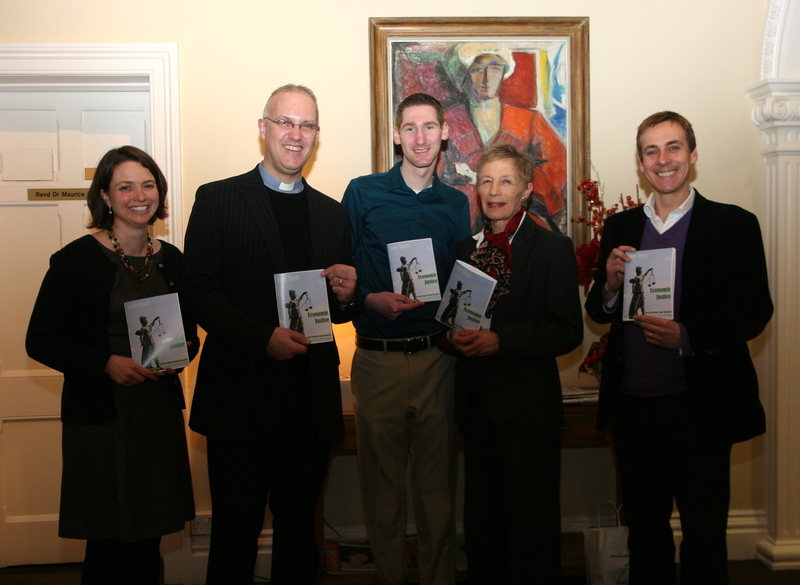 The Biblical Association for the Church of Ireland launched its 2012 Lent Study in the Church of Ireland Theological Institute on Wednesday (February 9). The five–week Bible study resource focuses on the theme of “Economic Justice”. Week by week, selected passages are given along with short commentaries, suggestions for further reading and questions for group discussion. The study was compiled and written by a team of Biblical scholars which included Revd Dr Ron Elsdon, Dr Katie Heffelfinger, Dr David Hutchinson–Edgar, Revd Dr Virginia Kennerley, Revd Darren McCallig, Revd Dr William Olhausen, Dr Jason Silverman and Revd Helene Steed. The theme was chosen so that the Church of Ireland can participate in the Anglican Communion’s “Bible in the Life of the Church” project. This project aims to discover how Anglicans worldwide read their Bibles and to begin to provide some tools that will enable a deeper engagement with scripture. Speaking at the launch, Dr Jason Silverman urged rectors to take up the study in their parishes. Four members of BACI’s interim committee were in attendance, Dr. Katie Heffelfinger, Rev. Dr. Virginia Kennerley, Rev. Dr. William Olhausen, and Dr. Jason Silverman, and the event was supported by CITI’s director, Rev. Dr. Maurice Elliott. BACI is an Anglican and Ecumenical organisation which exists to enrich and deepen the use of the Bible in the Church of Ireland by encouraging rigorous and faith–based biblical study. BACI seeks to represent and serve the entire Church of Ireland, geographically and theologically. The Archbishops of Dublin and Armagh are both honorary patrons of BACI. The study is designed to be used for Lent 2012 but it is not year specific and may be used freely in the future. It can be downloaded for use by the Church of Ireland, churches generally, groups and individuals at http://www.bibliahibernica.wordpress.com. A limited number of printed copies are available from the National Bible Society in both Dublin and Belfast at a cost of €2. The study can be accessed from the Lent 2012 tab above, or, the A4 format can be downloaded here and the A5 format here. BACI is pleased to announce that a limited number of the A5 format studies are now available, a small number of which are available at the National Bible Society for €2. They will also make an appearance at the Dublin diocese clergy conference next week. The Lent study will be formally launched this coming Wednesday, 8th February at the Church of Ireland Theological Institute.